A friend moved from San Francisco to San Jose this winter. Now that I’ve been visiting her on a regular basis I have an excuse to poke around. It’s actually pretty fascinating. Her tract home was built in 1947 on land that had previously been orchards. 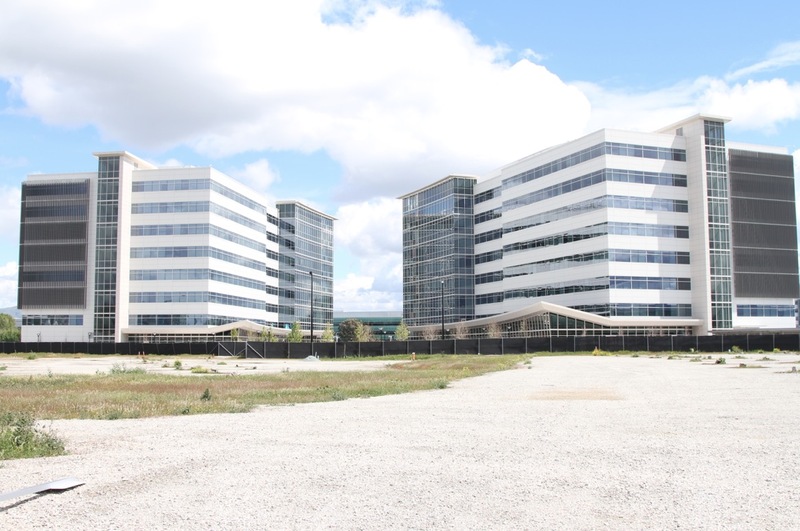 By the 1960’s the area had become home to military and aerospace firms that then spun off civilian electronics companies in little low rise office parks. 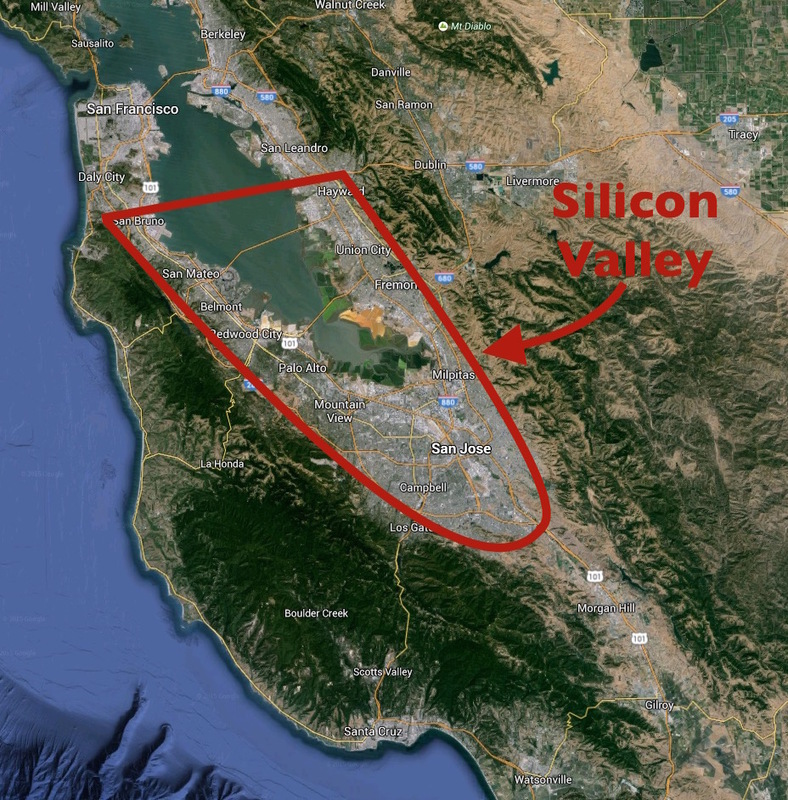 By the 1980’s the area had officially emerged as Silicon Valley. 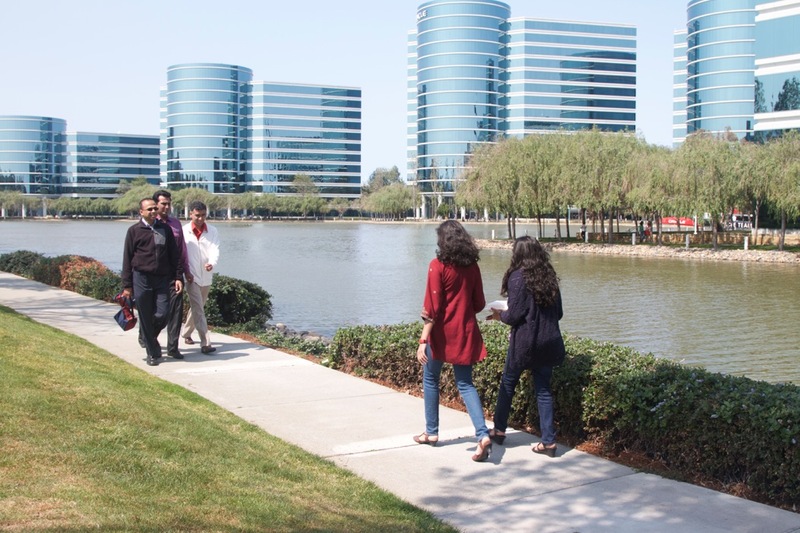 Oracle, Apple, Facebook, Hewlett-Packard, Microsoft, Google, eBay, Juniper Network, PayPal… these companies stretch out for miles in every direction. It’s an economic development dream for local governments. 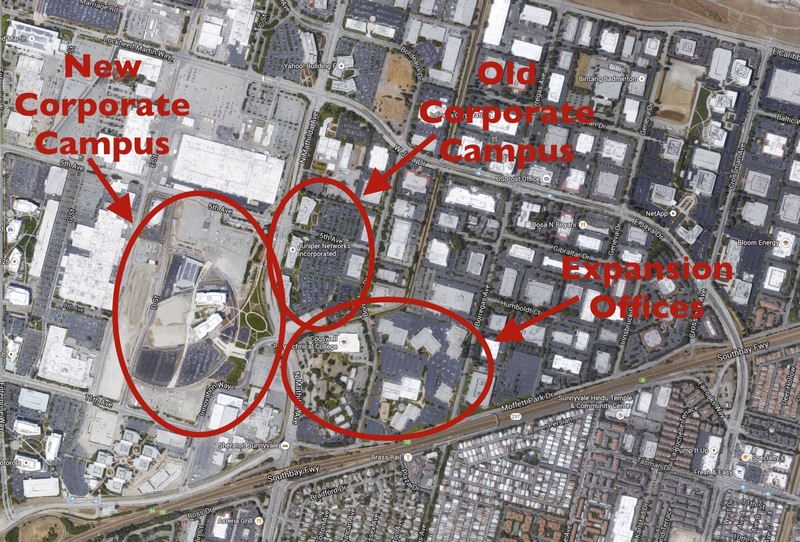 While there are a dozen separate municipalities (Redwood City, Cupertino, Mountain View, Palo Alto, Santa Clara, Fremont, Los Gatos, and so on) the entire southern end of San Francisco Bay is essentially one giant suburban corporate office park blur. 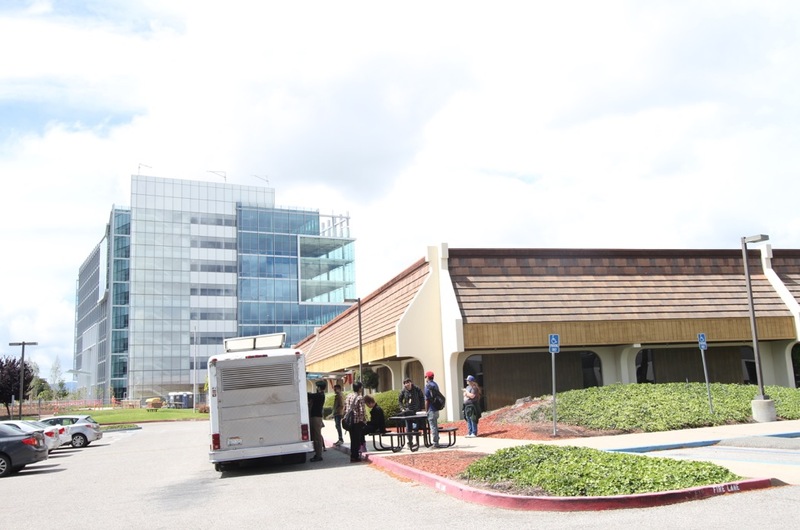 Here are three examples of the kinds of commercial buildings that served earlier waves of businesses in Silicon Valley. They were probably built between the 1970’s and 1990’s. 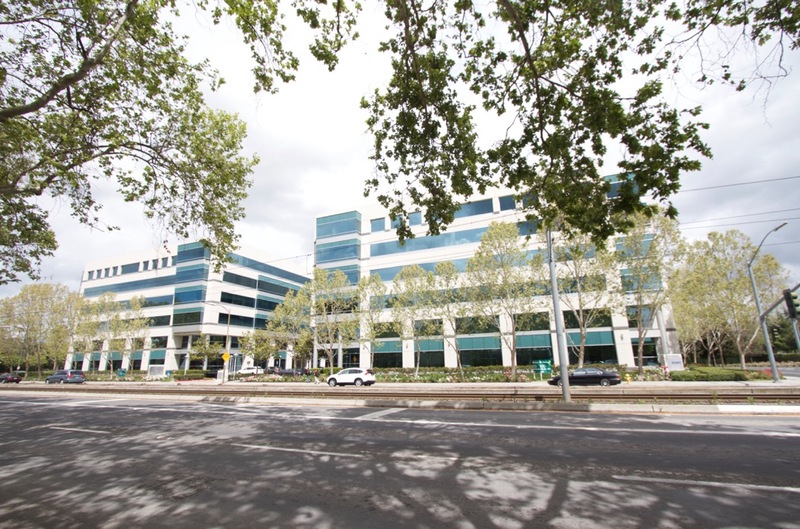 This office park happens to be in the town of Sunnyvale, but nearly identical arrangements can be found all over the Bay Area. In fact, I bet there are buildings just like these in whatever town you live in too whether it’s in Florida, Michigan, or Utah. 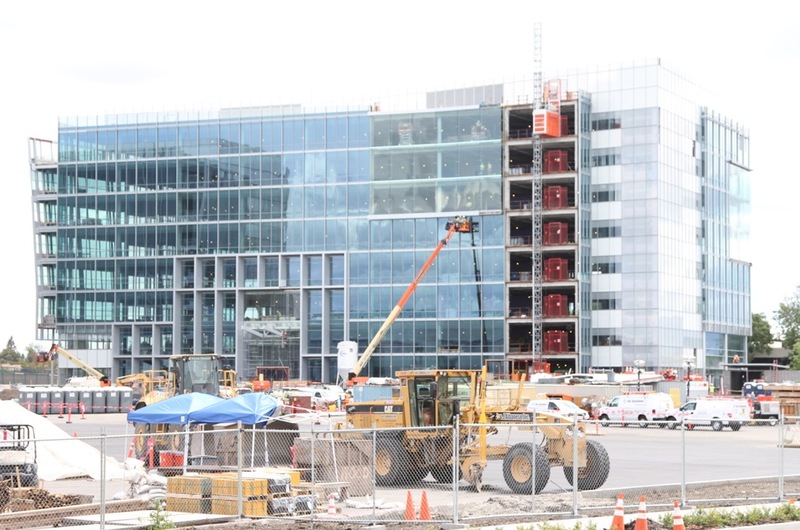 Here’s what’s happening to these office parks as the economy heats up. 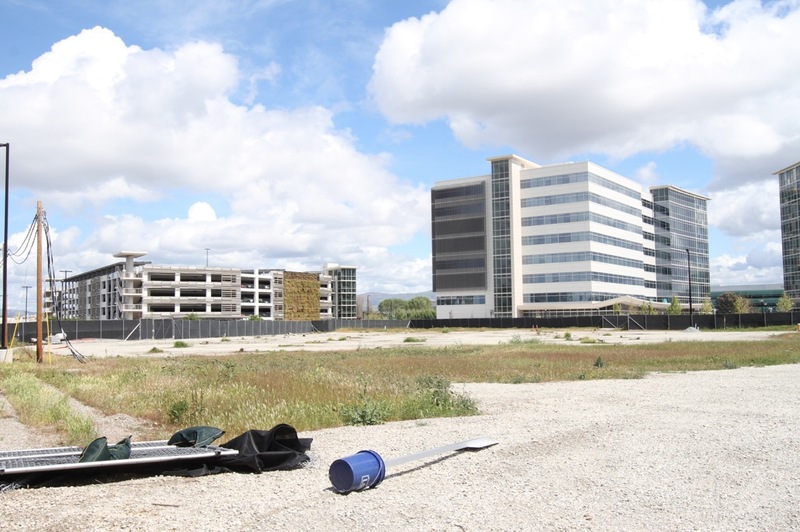 The land has become very valuable and it makes good economic sense to build new eight or ten story office blocks on vacant land and surface parking lots. 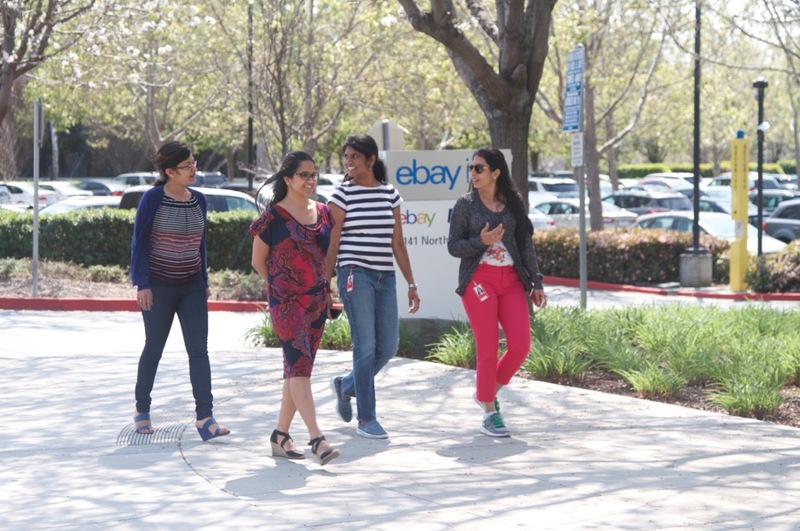 It’s good for the tech companies who want to expand their existing operations. It’s good for the land owners who can cash in on the sale. It’s good for the city since it brings increased tax revenue to the municipal coffers. And it’s good for people looking for high paying jobs, both in the initial construction phase and later office workers and support staff. There are, of course, also problems associated with this kind of redevelopment, which I’ll get to in a minute. Here’s another construction site directly across the street. The old one story buildings were scraped and are being replaced by parking decks and office blocks. 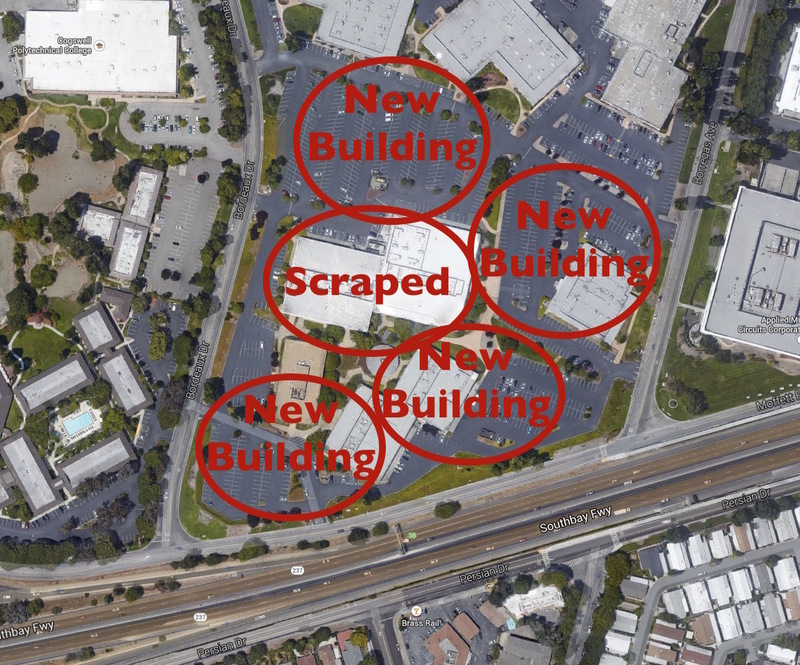 These are all part of the same company that is experiencing rapid expansion and doubling their corporate campus that already has over a million square feet of space. These few buildings alone will ultimately house another eight hundred well paid workers. Part of the long term plan for this site is to include a two hundred room hotel for business travelers associated with the company. 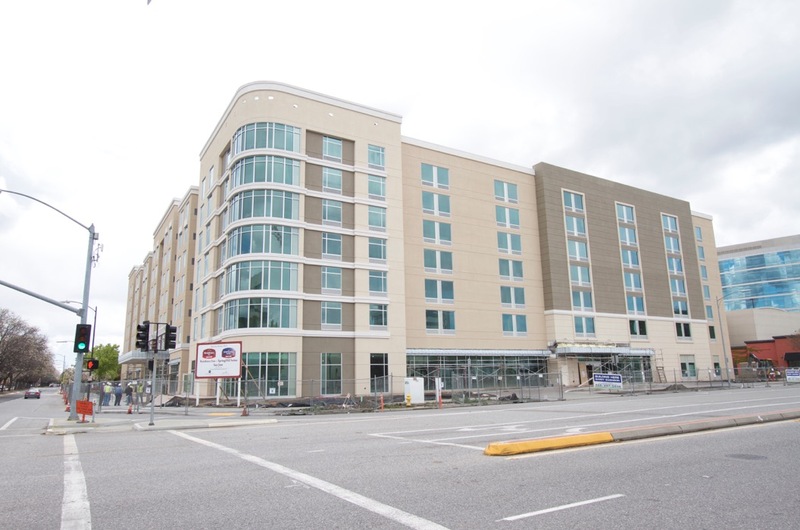 Perhaps that new hotel will replace the existing one story motel. Here’s the bigger picture. 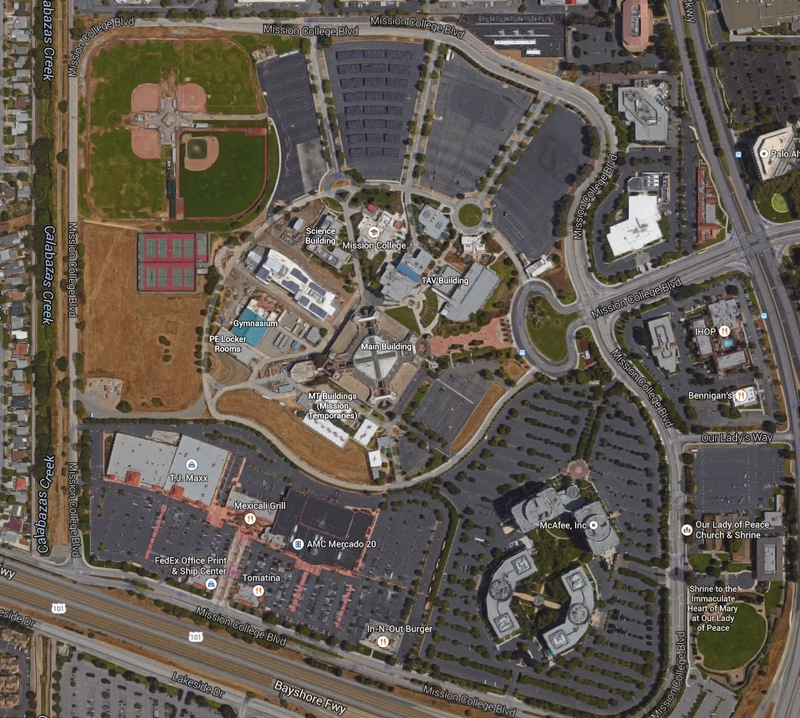 Zooming out on Google Earth you can see how multiple older office parks are being absorbed and folded in to much larger more unified corporate complexes. The scale of the construction is too large to capture even with a macro lens on the ground. 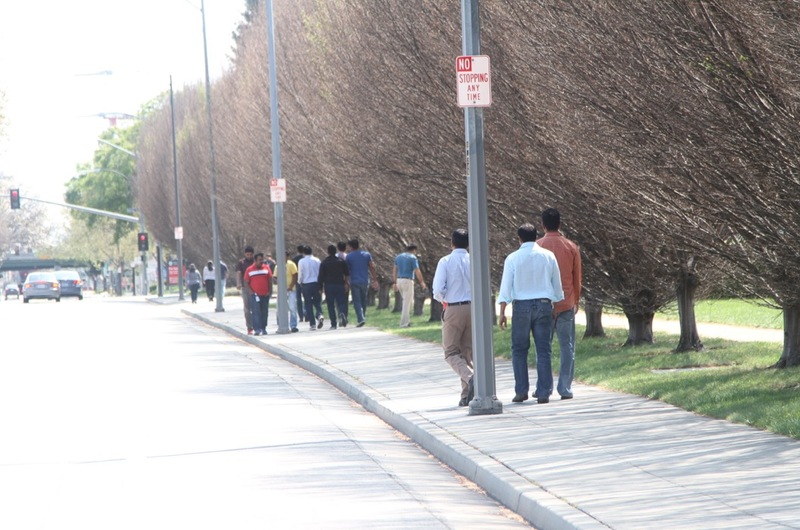 These tech workers were walking between buildings at lunchtime and it was quite a trek. This kind of land use intensification is actually very similar to how old orchards were converted to residential subdivisions. Land values increased and property was pressed into service for tract homes which were much more lucrative than apricots or prunes. 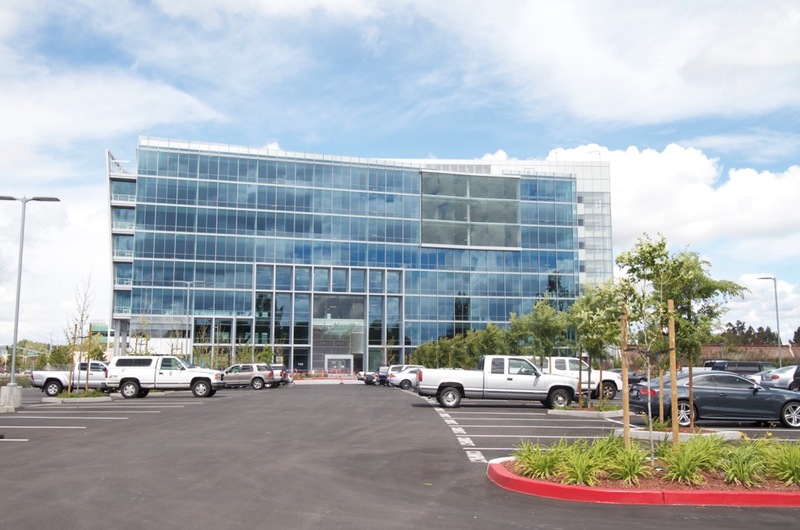 The same process is now unfolding at the next higher economic level with office parks. If I hadn’t taken these photos myself I would swear some of them were computer generated. The buildings have such a generic AutoCAD look about them. And there are dozens of them at this one site alone. Here’s another corporate campus. 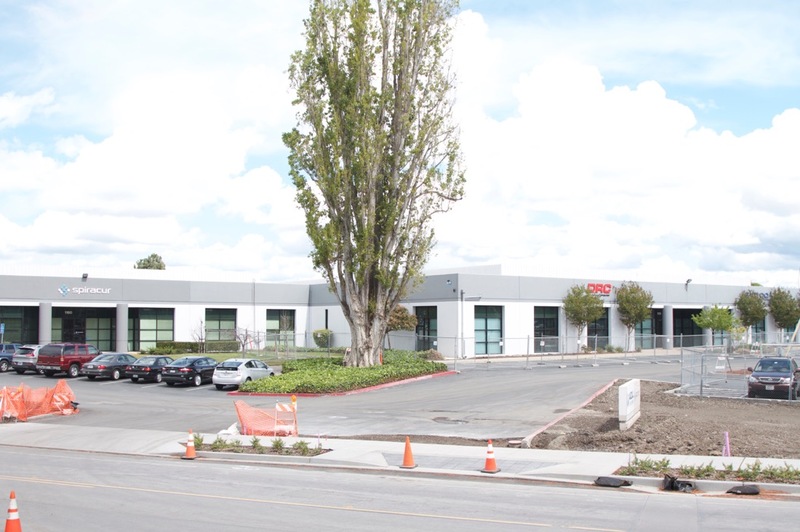 This one is in Redwood City. Everywhere you look the old one and two story buildings are being razed and replaced with significantly larger buildings. 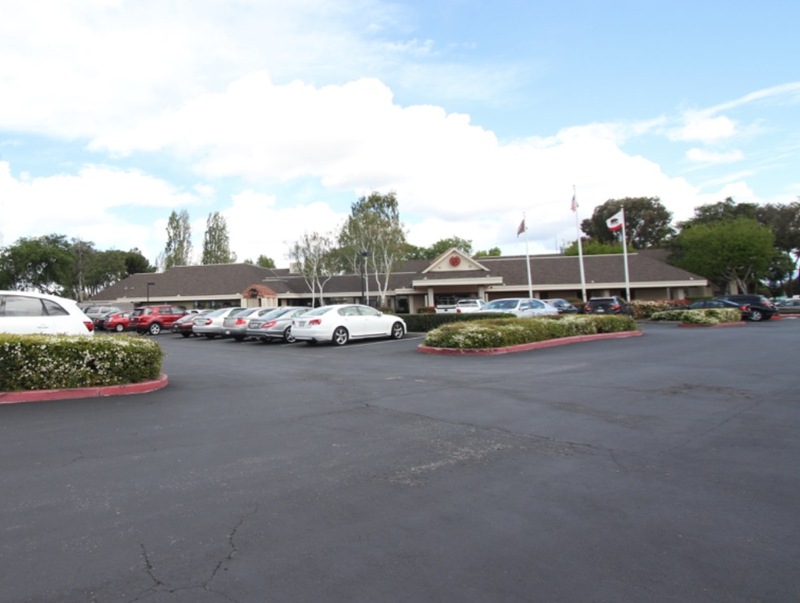 The schmaltzy motels, strip malls, and office parks of previous decades have been upscaled both physically and economically. This was once open water and marshland that was filled, dredged and contoured in the 1960’s, but has since been redeveloped to a higher value use. Companies are fond of the “theme park” suburban campus where the environment is akin to an all inclusive resort destination for workers. These are islands – sometime literal islands – in the suburban landscape. 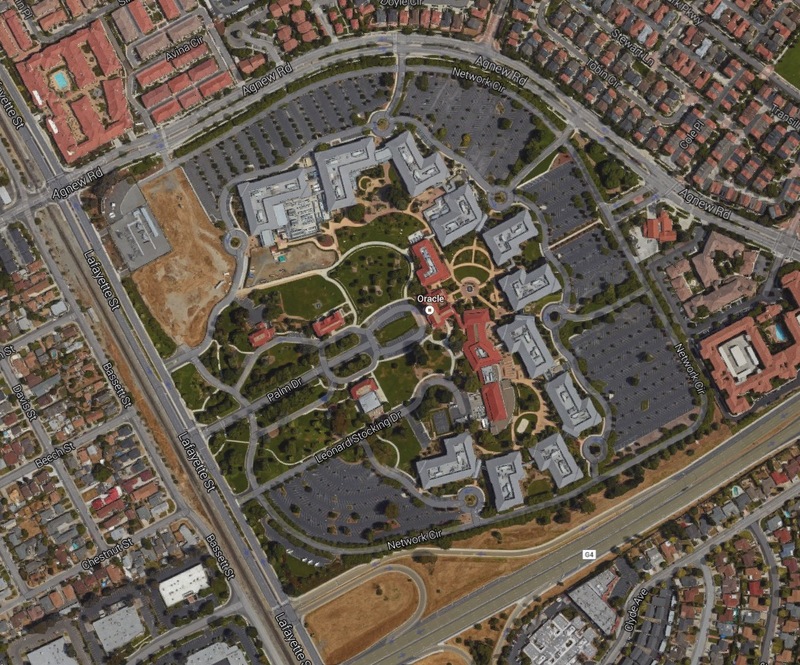 From the air these corporate campuses look a lot like Epcot Center at Disney World or a regional shopping mall off the side of a highway. 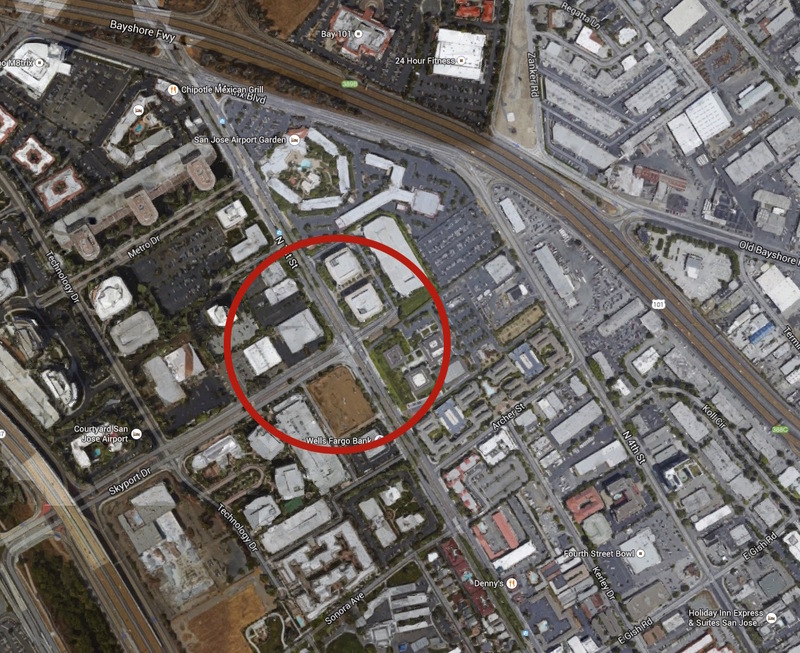 This inward looking mega block form of development is common in suburbia. 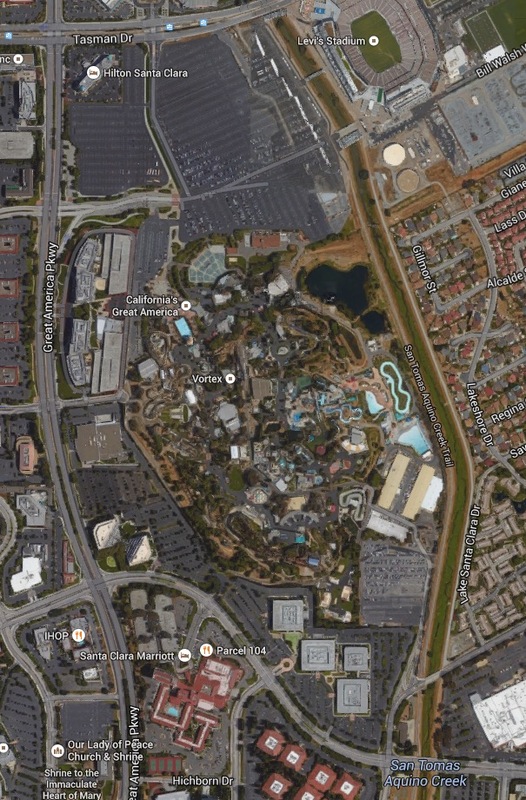 The images above show a college, an amusement park, and a corporate office park. When you’re inside one of these bubbles it’s actually very pleasant. But getting to and from these locations is pretty much impossible without a car. Even if you live directly across the street walking wouldn’t work all that well. 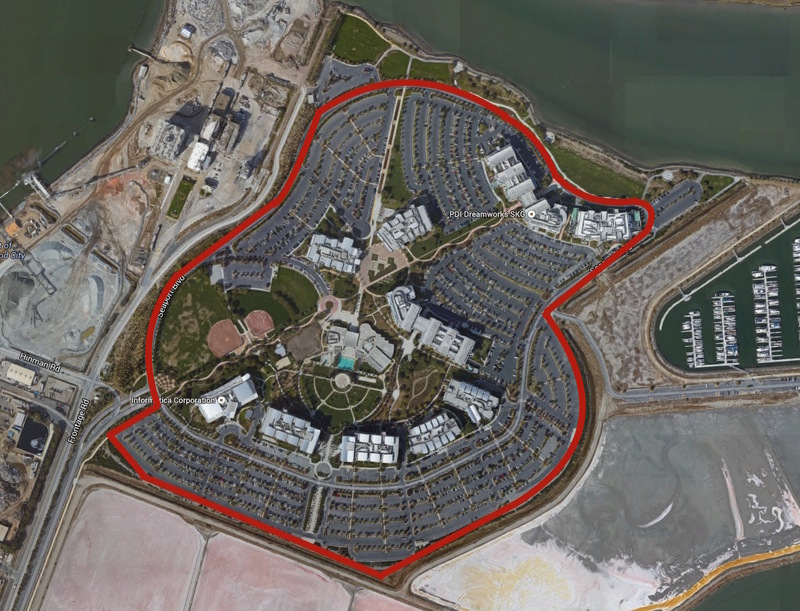 Add in the fact that many of the nearby residential subdivisions are gated communities and that each of these bubbles are separated by highways, walls, and drainage canals… a car becomes essential. That loads the road network with an insane amount of traffic. If the one story buildings incrementally ramp up to eight story buildings you have a very big transportation problem on your hands. 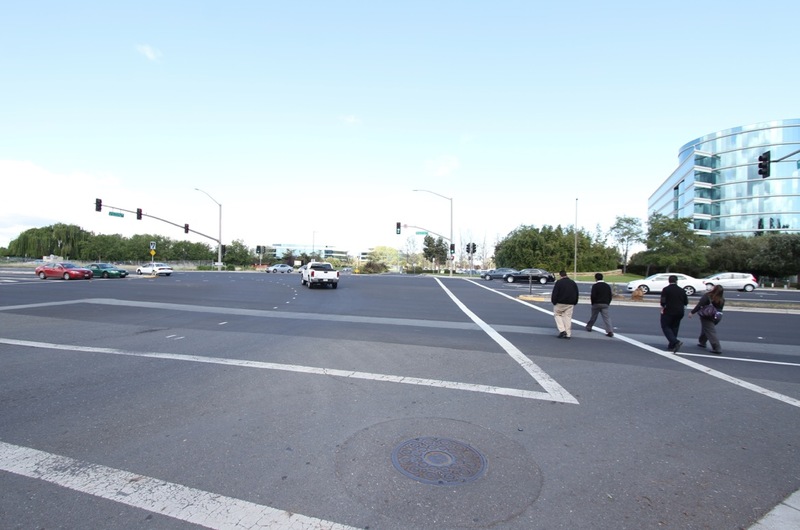 Here’s an intersection halfway between my friend’s house and the corporate campus where she works. 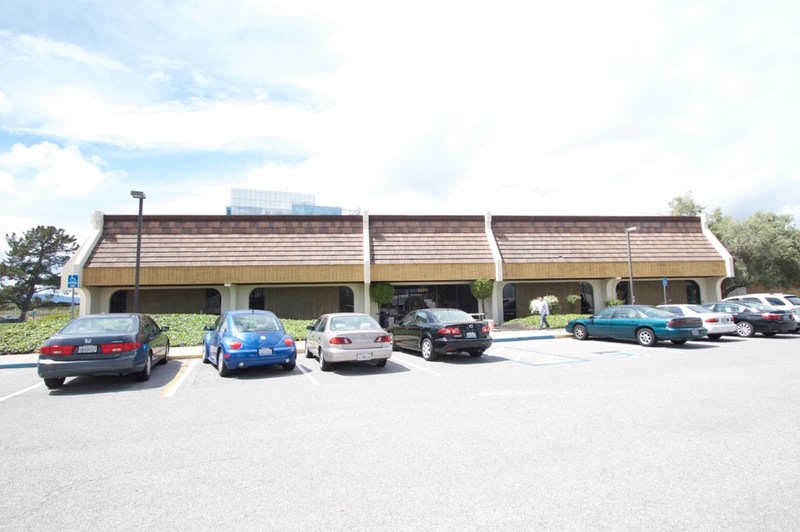 It’s a typical suburban commercial corridor lined with standard one story buildings of the office park and light industrial variety that were built anytime from the 1960’s to the 1990’s. Here’s what’s happening all around Silicon Valley. The small old buildings are being replaced with much larger ones. These aren’t exactly skyscrapers, but they’re significantly more substantial than what was there before. The same thing is happening with residential property. The old suburban roads lined with gas stations and Kwickie Marts are giving way to multi-story apartment buildings with underground parking decks. 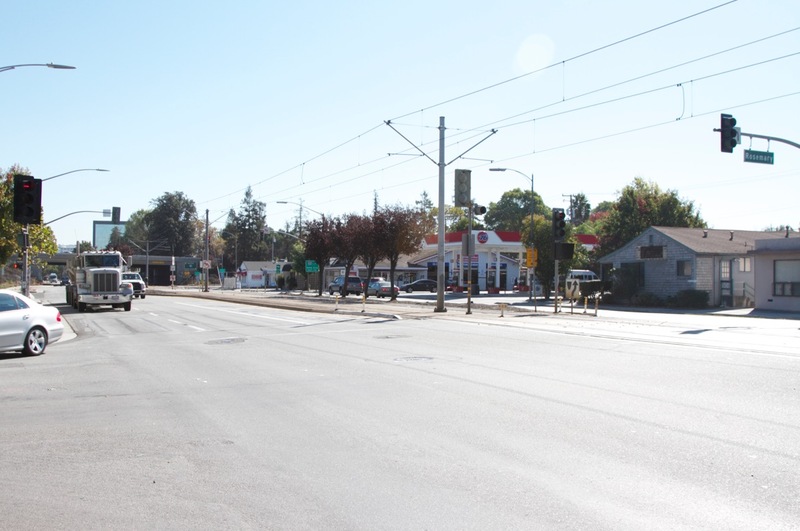 These two photos show two sides of the same street. 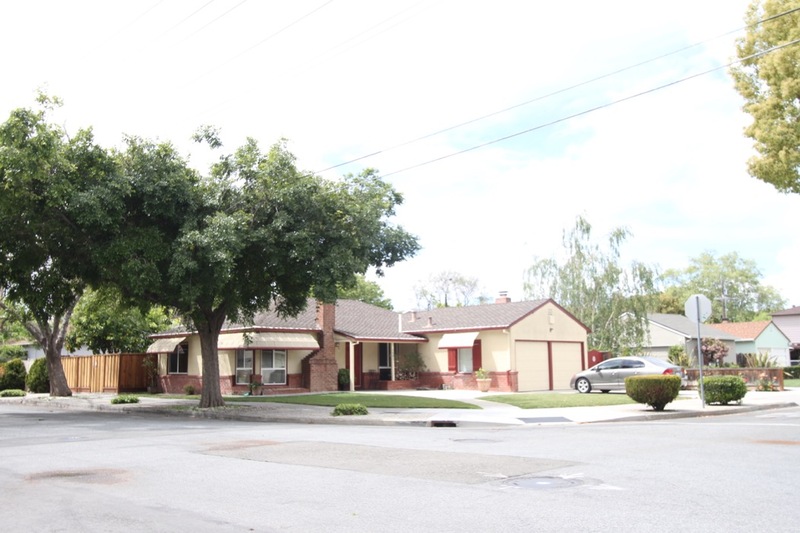 This spot is immediately adjacent to a 1950’s residential subdivision of single family homes. 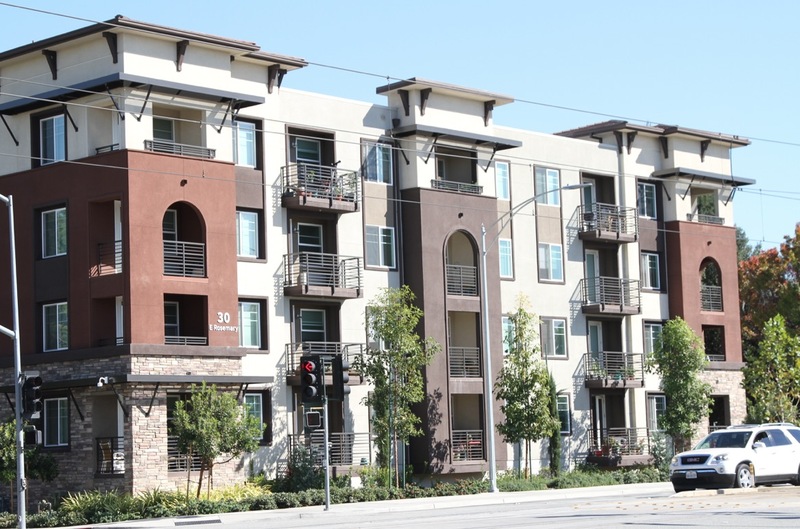 The apartment building fills a need for workforce housing at a high, but tolerable price. One bedroom apartments in this neighborhood rent for about $2,000 a month. Two bedroom units rent for closer to $3,000. If you want to buy an actual house the bargain basement fixer uppers start at $600,000. There are a lot of people in the area who can afford to carry a mortgage of that size, but the problem is often the down payment. Twenty per cent of $600,000 is $120,000. That’s a hurdle many people struggle with. I’ve seen some very nice double wide trailers for sale in the $320,000 range, but that doesn’t include the land under the trailer which you would still need to rent. So rental apartments and condo complexes are in fact necessary in this area if many workers are to live anywhere near where the jobs are. That brings us to some of the serious problems with an economically successful suburb. 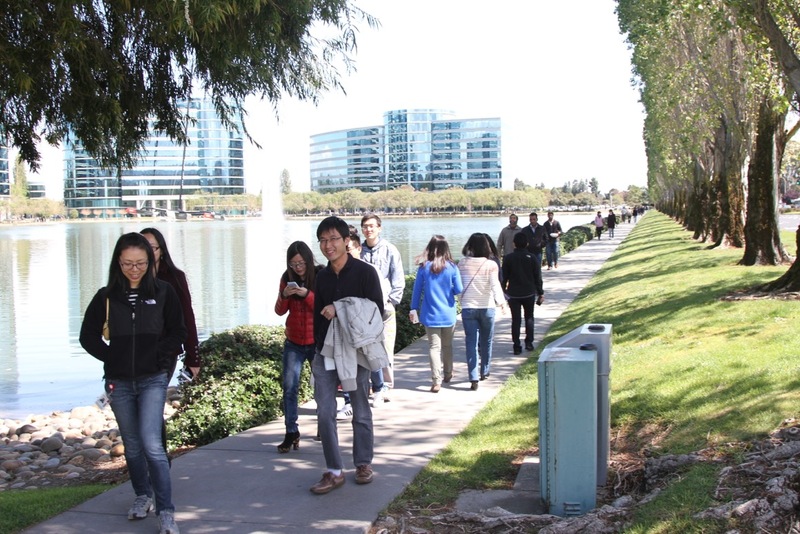 Silicon Valley, as the name suggests, is hemmed in by mountains and water. All the flat, easily developed land has already been built on in the standard suburban fashion. Over the decades highways have been built through mountain passes to access new land on the other side of these mountains and many people and businesses have expanded outward to the far edges where possible. But the resulting transportation bottlenecks and commute times are severe. Driving to and from Silicon Valley to the outer outer outer suburbs is like pouring molasses through a funnel. People are willing to pay a lot extra to not have to endure that schlep every day. In theory public transportation could ease the commute for many people, but the dispersed development pattern guaranties that transit will never be efficient or cost effective since most people need to drive from their house to a transit center and then take a shuttle bus to the office at the other end of the train line. Living closer to work is a better option for many people. If you have a million dollars on hand you can buy a nice big home with a front lawn and swimming pool in the back yard. Many people in the area do. The median income in Silicon Valley for people with a bachelor’s degree is $95,000 a year. That’s the median, so half the working population earns more than that. A million dollar house is within reason, particularly if there are two incomes per household to carry the mortgage. If not, living in a condo or apartment complex is the next best option. From my perspective these intensifying suburbs are in an adolescent phase of development. They are rapidly losing the qualities that people like about the suburbs: open space, privacy, convenience, quiet, lower cost, ample free parking, and so on. But they aren’t yet delivering the things people like about cities: culture, vibrant street life, walkability, convenient public transportation, night life, and such. 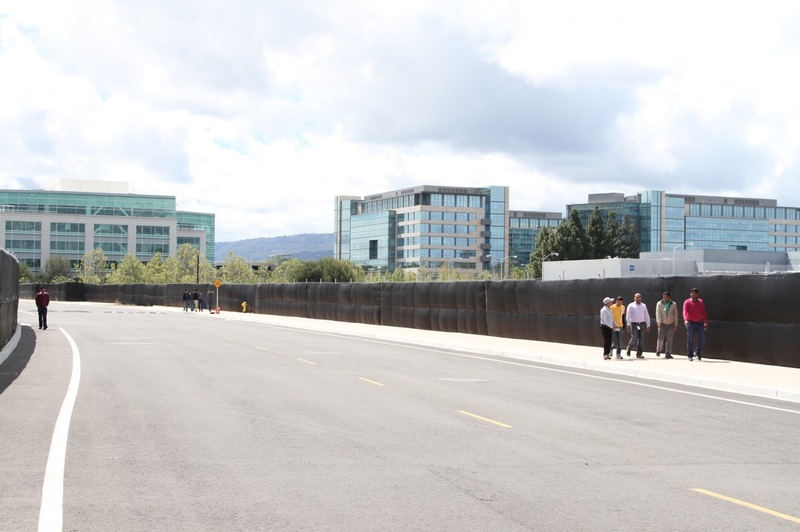 I stopped and took photos of large numbers of tech workers walking along the side of the eight lane highways at lunchtime. There isn’t anyplace for these folks to walk to. There’s nothing but parking lots, highway fly-overs, gas stations, landscaped berms, and convenience stores as far as the eye can see. When I ask the workers where they’re going they say they’re just stretching their legs and getting some air. They eat lunch (and very often breakfast and dinner) inside their office compounds in subsidized cafeterias. Perhaps in another thirty years the transformation from suburb to something more vital may be complete. Given the suburban chassis these places inherited I don’t see how the underlaying infrastructure will ever support anything other than a bad compromise. Joel Garreau calls places like this Edge City: a place that has a suburban form but at an urban density. Driving private cars is no longer convenient here anymore, but transit will never function well either. Jobs are plentiful, but housing is too expensive. It lacks the privacy and peace of a good suburb, but is deficient in the vibrancy and culture available in a real city. It’s too thick to be jam, but too thin to be jelly. Its interesting to know and understand how cities grew. Urban areas and the field is now getting more and more attention. The importance has now been realized also the related fields like geography, civil engineering also playing important role in building cities. Your article really helped. Probably a short video will also add to the usefulness of this information. A similar article with apt information on Concentric Zone Model and Central Place Theory valuable facts and information. Details on other such topics like Sector theory, multiple nuclei theory will add to the quality of content. Oh and Caltrain is really ridiculously loud. 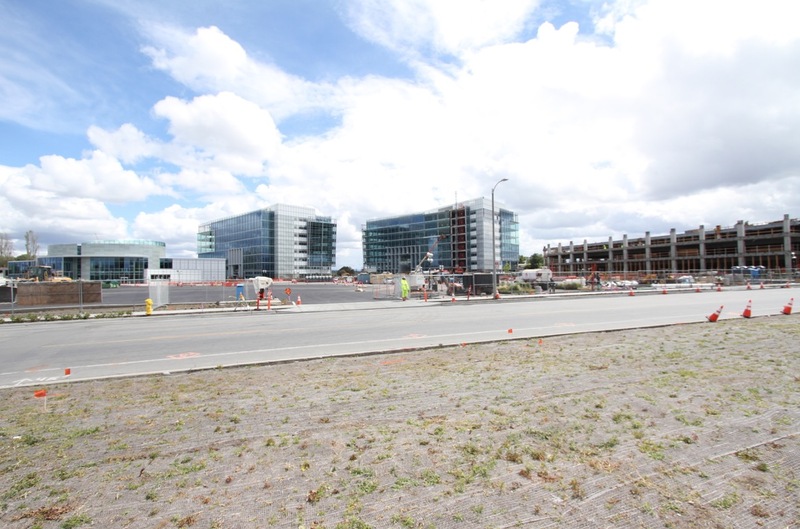 I looked at brand new apartments a block from a Caltrain station. Even with their new steel+concrete construction, thicker double-pane glass, etc, it was still too much noise to be comfortable, especially at next-to-Caltrain prices (like loud train horns and really loud brakes, not just regular city noise). 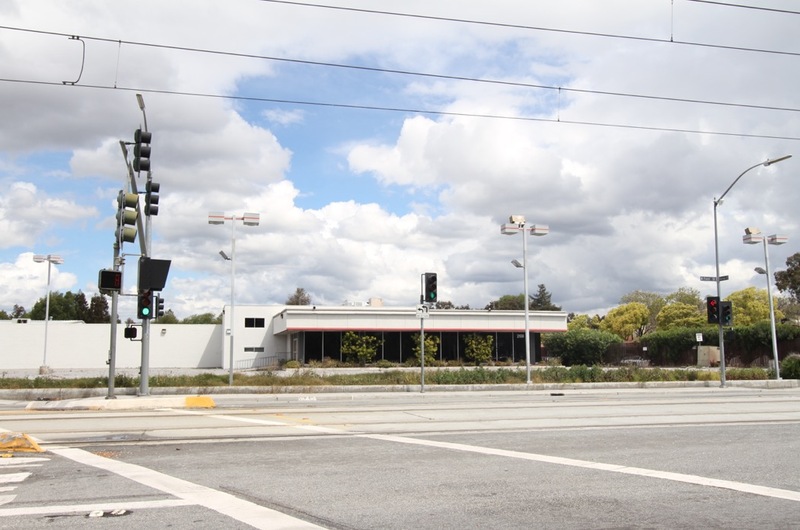 It’s hard for me to imagine Caltrain in its current form becoming any sort of transit hub like a subway or light rail. I think if it were easier to live next to, at least there’d be a push on the higher end of the income bracket to build up next to it. 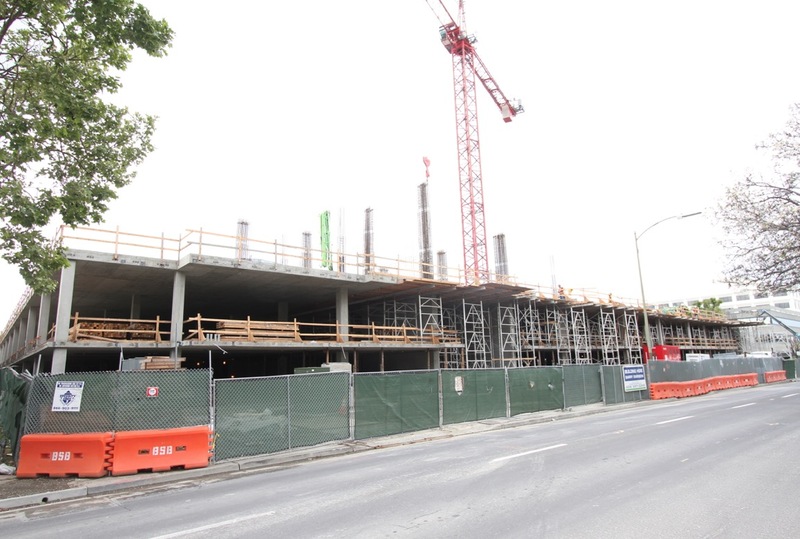 What’s been fascinating for me lately, living in Redwood City, is that Downtown RWC has been undergoing an awful lot of exactly the renovation you describe—many new multi-story residential buildings. But within the downtown walkable area there has also been an attempt to add multi-story office buildings. Recently Box agreed to rent out the entirety of one of the largest ones. The fascinating part is the reaction of residents lines up with what you’re saying. People have asked me to sign several petitions demanding downtown be kept residential. It’s a constant topic on Nextdoor as well. No more companies with money, please, just houses and maybe restaurants and maybe ok it’s nice to have some shops. I guess the suburban origins are trying to reject even basic notions of a sane commute in an urban environment. Unrelated, I agree about the Oracle buildings being just as bland and office parky as the rest, but it is worth noting that there is an almost shockingly theme-park-like concept behind their design: They’re supposed to look like the iconographic representation of a database (which in turn was designed to look sort of like a bunch of hard disk platters + heads). 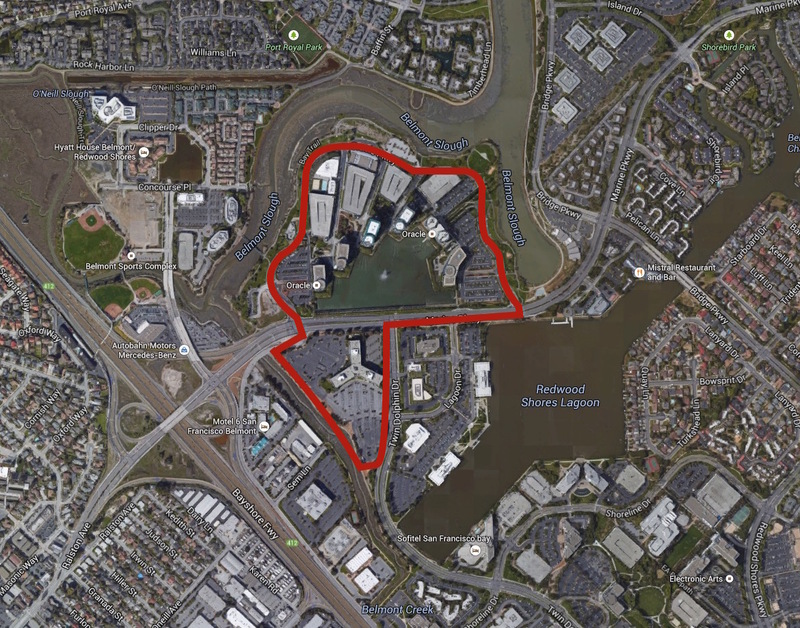 This post seems to completely ignore the urban areas of Silicon Valley, particularly of note would be downtown San Jose, an urban walkable downtown area in San Jose, not to mention the other urban neighborhoods like Japantown, Willow Glen, the Alameda, these areas, and the downtowns in the peninsula were built up long before the suburbs surrounding them were. 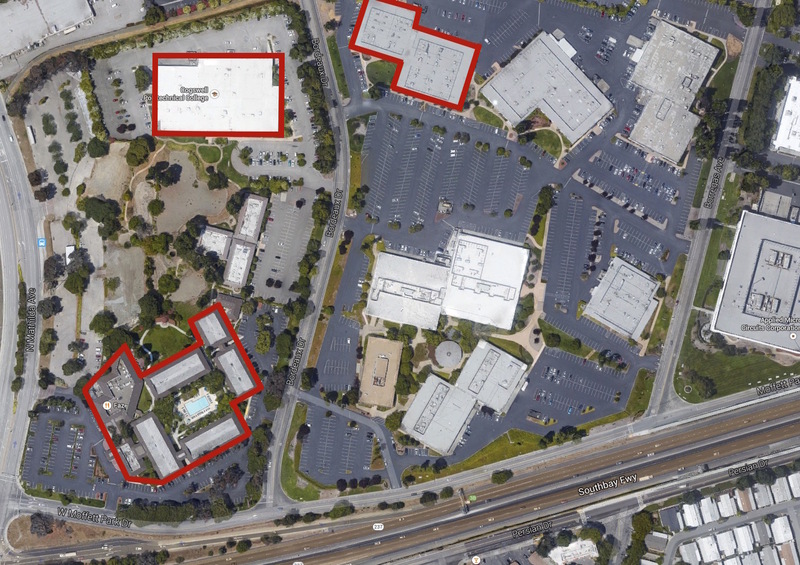 I would say while tech companies have ignored these places in San Jose, they haven’t necessarily done so for most peninsula downtowns, it is the case though demand for office space may be very high in downtown Palo Alto, the city will not zone for large offices there. On the other hand downtown San Jose has plenty of office space, but little demand, especially from high paying tech companies. 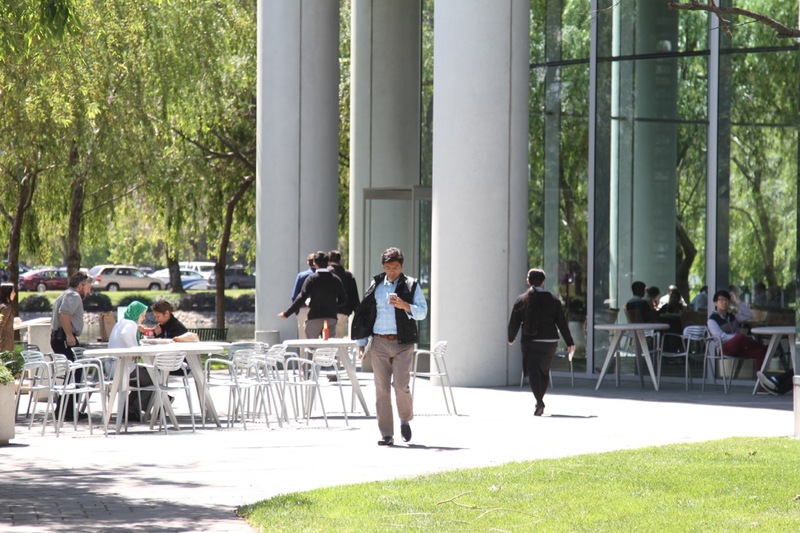 Most are not really interested in setting up shop in an urban area, where they can’t control the employees being around as much as they can in an isolated campus. Going to these downtowns would give you a very different idea of what is building up and not building up in Silicon Valley. 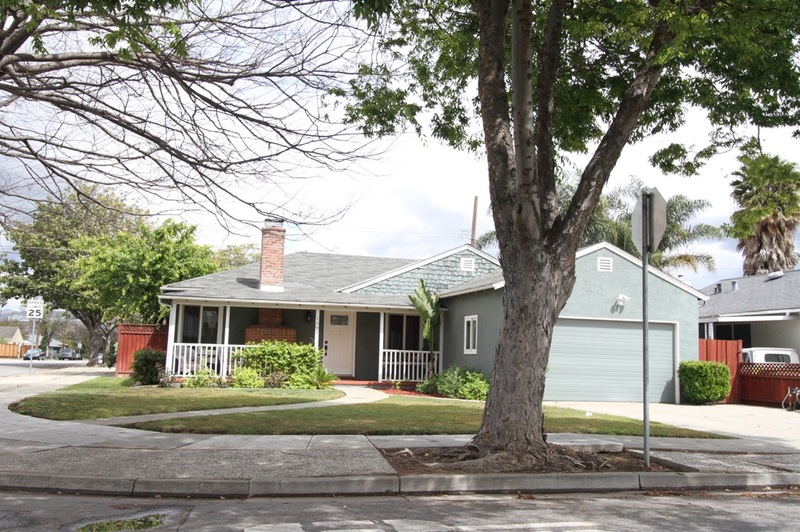 Downtown San Jose has a lot of new residential projects, but little new office space, downtown Mountain View has a few offices and a few new housing options. 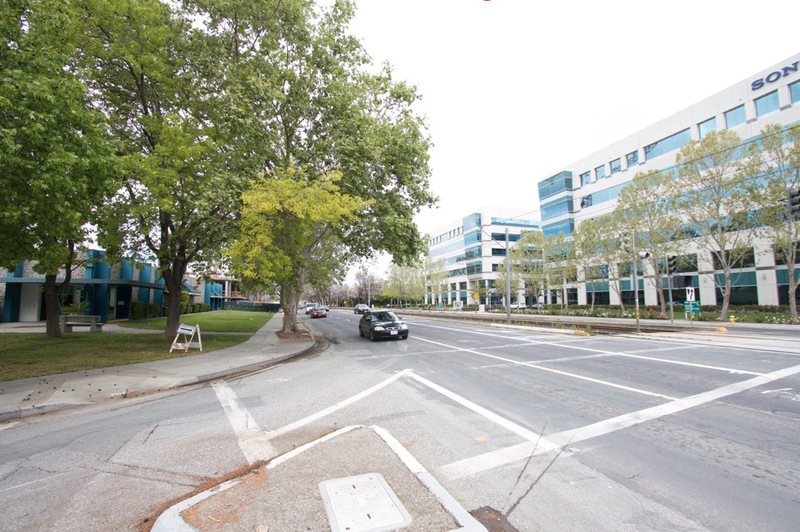 While downtown Palo Alto has 1 or 2 new offices and no new housing. I think the most revealing these days is downtown Redwood City, which was once derided as dead wood city. But yeah go to downtown San Jose in the middle of the day and you’ll see a lot of people walking to get a bite to eat, similar in downtown Mountain View and downtown Palo Alto. Briefly, you’ve got some of it right here, but not so much. San Jose is very much Not an edge city. Novato, Walnut Creek. Also, the boom & bust cycle is a much bigger part of the commercial real estate market would show. Frankly, it doesn’t make sense for anyone to buy in a boom market. Rent, and sometime over the next 15 years, the price cycle will make buying -even a decade late, a better deal. Boom growth is unsustainable growth. That which is unsustainable…..shall not be sustained. The biggest real understanding local SV governments have, is that by now they’ve seen enough boom/bust cycles to plan for it reasonably well. 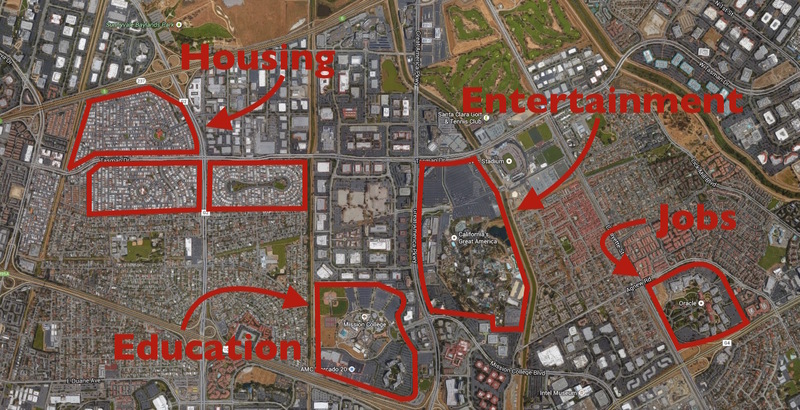 The quality of life in SJ isn’t sububitopia, though compared to Oakland, Berk, & SF it may look that way. The most defining thing about SF/SV is the mountainous valley nature of the big cities on the N half of the W coast. Compare the land use patterns in Portland & Seattle. If you want a better analysis, make better use of existing Urban Sociology models, historisize the analysis much more deeply do more comparison to similar cities. We are in broad agreement, but differ on some of the particulars. I advise people not to buy real estate anywhere in the Bay Area at this time. Bubble. Wait. Better yet, move to some other part of the country. You lost me with “SJ isn’t sububitopia” and “Urban Sociology models, historisize the analysis”. I define an Edge City as a place that has suburban infrastructure with urban density. That’s San Jose. 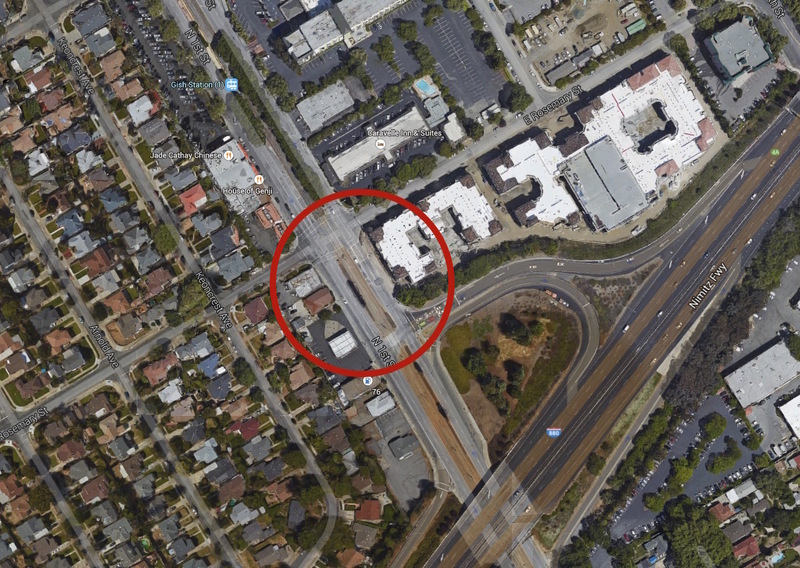 “Exhibit A” is the San Jose Earthquake’s soccer stadium next to the Lowe’s parking lot and the In-and-Out Burger drive-thru. 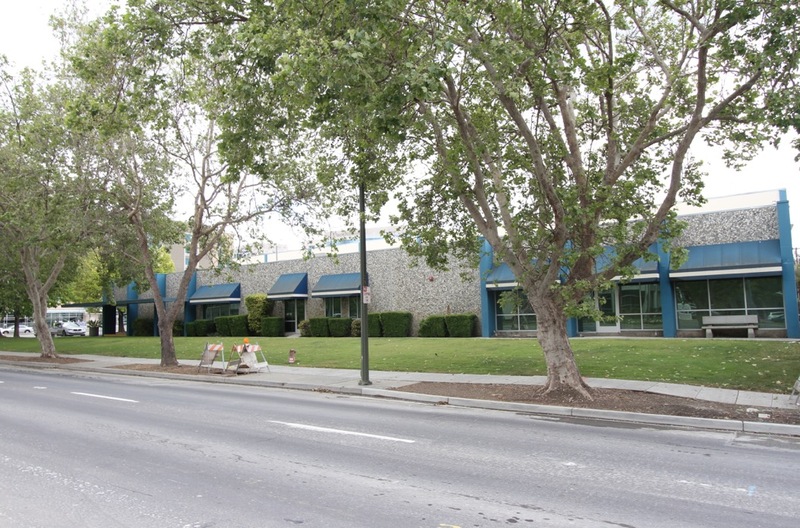 Downtown San Jose (City Hall, the convention center, the Tech Museum…) is an office park. Surface parking lots, landscaped berms, lots of decorative but useless “open space” with expensive nondescript plop art sculptures, the complete spaghetti freeway overpass bonanza you can see from the International Space Station… Whatever pre WWII historic architecture or urbanism might once have existed there was systematically removed or sanitized over the last seventy years. 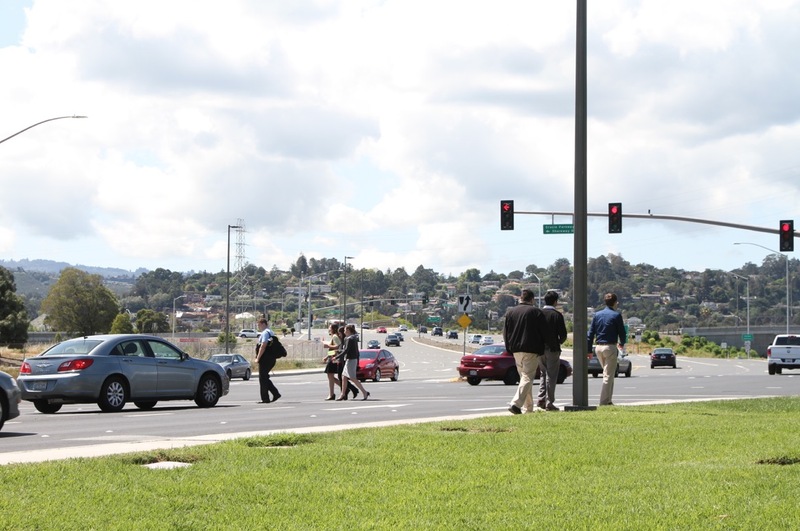 San Jose is too much to be a good suburb and way too little to be a good city. Edge City – textbook example. 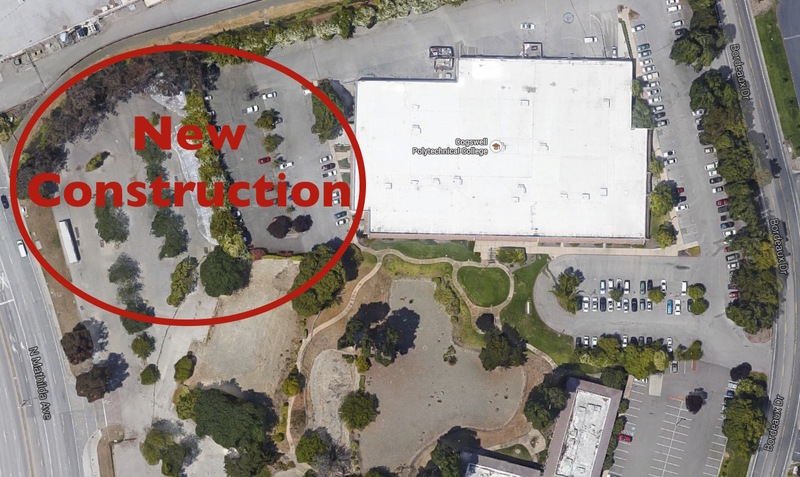 I think you’re missing a piece of the puzzle – traditional downtowns up and down the Peninsula are being renovated, often with relatively dense housing attached. 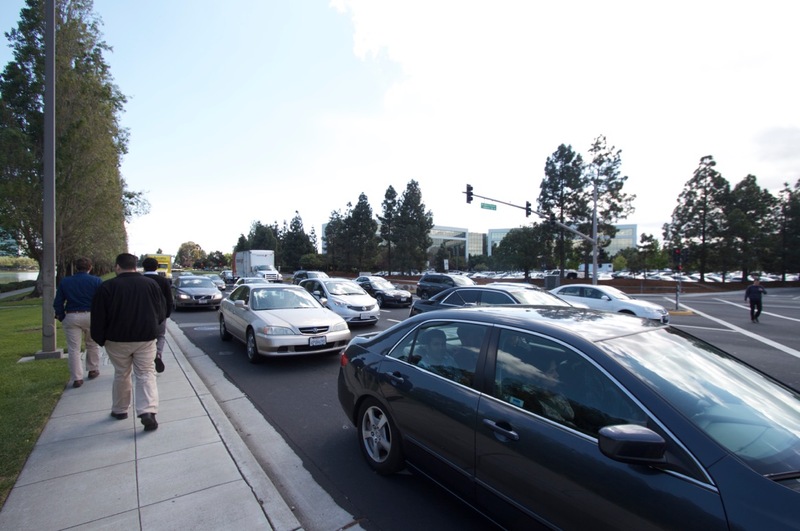 Burlingame, Mountain View, Palo Alto, Redwood City, San Mateo – they’re all packed thick with pedestrian traffic on the weekends, by suburban standards anyway. 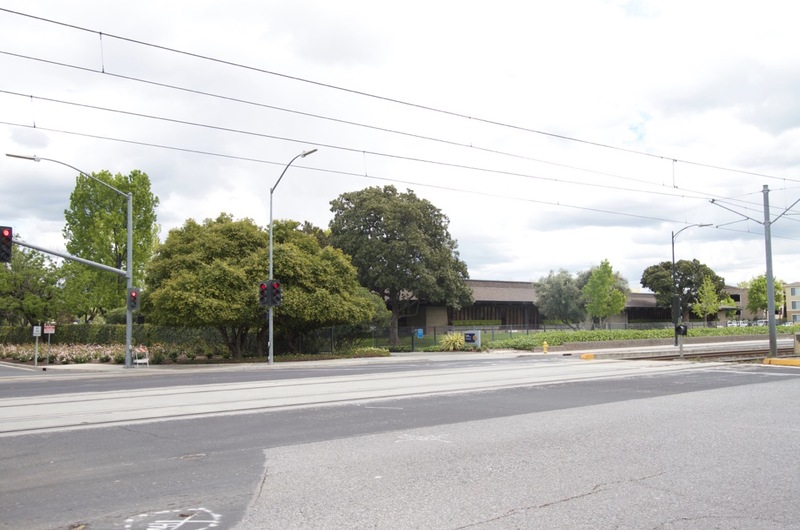 More plans are on the book and some cities that never had much of a downtown – like Sunnyvale & Colma – are building from scratch. Many folks like sprawl so traversing it is not such a chore, traffic notwithstanding. Their idea of nirvana is more Beverly Hills than Brooklyn. I think this applies especially to immigrant tech workers. 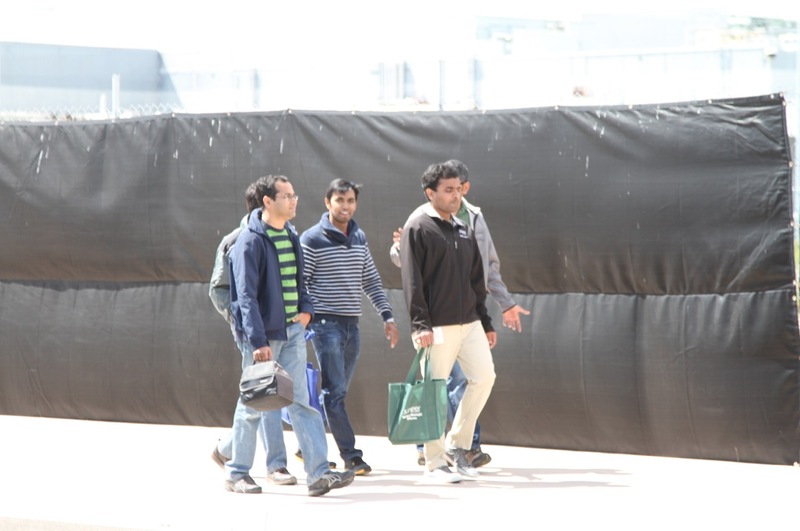 We once hosted our Indian counterparts at a trendy Mission District restaurant. They were polite but looked non-plussed at the surrounding squalor. We found them outside taking pictures of a Harley. It was the the biggest motorcycle they’d ever seen and would be illegal in India. Subsequent Facebook posts included pictures of tech campuses (where people they knew worked), big SUVs, big houses and the wide clean streets of the Valley. The exotic American Dream. But yeah, the cost of that suburban dream (or my urban dream) in the Bay Area is just absolutely crushing at this point. People with good jobs are compromising left and right. Condo instead of a house, commute from Sacramento!, move to Portland, Austin or L.A., pool family money to buy a house – these are just a few reactions I’ve seen to this crisis. I think long-term things will even out with other Western states being the major beneficiaries (or victims?) of California’s inability to deal with our housing/transportation problems. I see the analogy to LA, but I think Silicon Valley has a worse pattern. A significant portion of the employment growth in LA is happening in walkable, transit-served neighborhoods like Downtown LA, Downtown Culver City, and Santa Monica along the Expo Line. 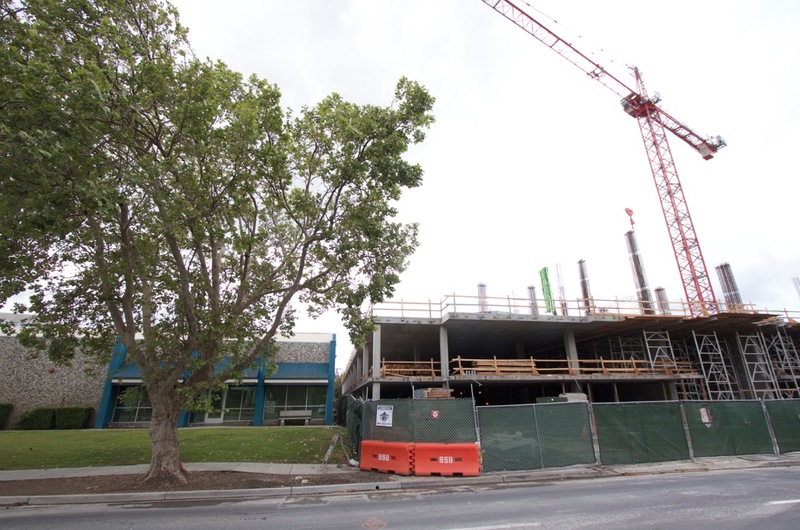 The traditional downtowns in Silicon Valley are improving, but they’re getting housing growth, not employment growth. 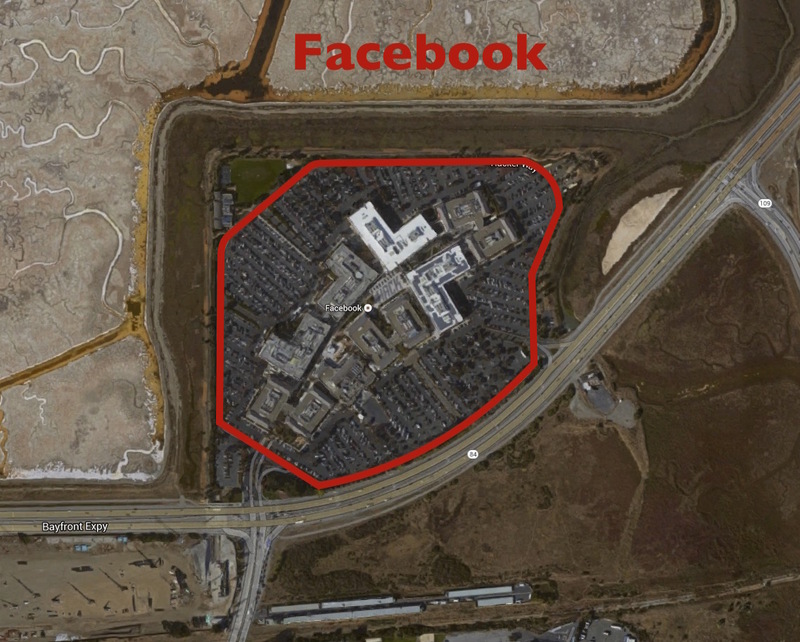 The communities didn’t want employment causing traffic in their centers, and the companies generally want the kind of isolated, large scale office park setting shown here. The housing is good, but the concentration of employment growth in office parks means that people can’t/won’t get there on public transit, which has a miniscule mode share there. 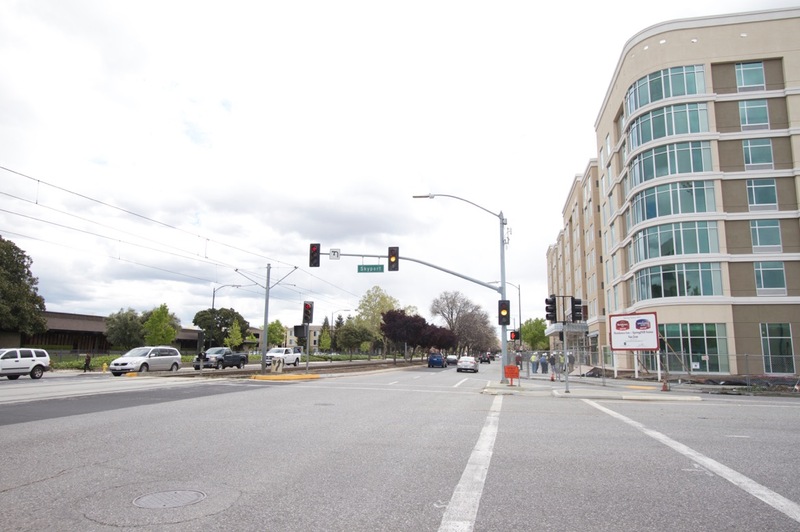 The Silicon Valley downtowns are nice enough–and have plenty of consumer money sloshing around them–but they don’t feel like where the action is. Also, with the exception of the El Camino Real bus corridor, the major bus and rail transit lines in LA are more frequent than in Silicon Valley. In Silicon Valley, the Caltrain commuter train runs once an hour except during weekday peak hours. San Diego and Vancouver are two places where residential seems to be taking over downtown. 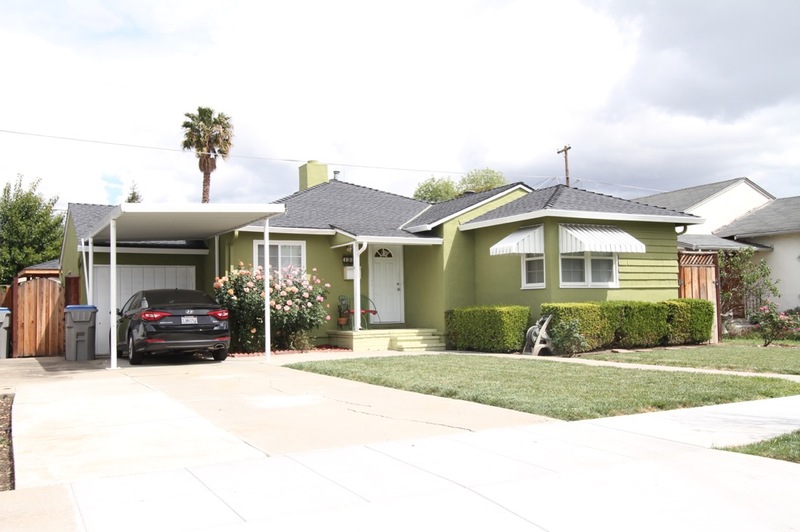 A bit off topic, but take a look at this: http://www.zillow.com/homes/for_sale/pmf,pf_pt/house,mobile_type/0-200000_price/0-725_mp/priced_sort/41.345887,-71.94809,40.195659,-74.628754_rect/8_zm/ If the link works right, that’s Long Island and all the blue dots are foreclosed properties; I counted around 11,000 of them in the drop down ‘for sale and foreclosures’ link. I wonder if Hurricane Sandy blew a lot of houses away and with it, the jobs, if the insurance companies refused to pay out for damages, if the govt hasn’t gotten around to making things right yet (ha!) or what… I’m actually at the point where I’m expecting a Category Six hurricane to take out the entire Eastern Seaboard one of these years. Ever higher sea levels combined with more violent storms equals a mess for what, one third of the population of the U.S.? Already I’ve read that the Naval ports in the Carolinas are having to adapt to higher sea levels and frequent flooding every time it rains. The link you provide shows foreclosures – and there are many of them on offer in the greater New York metroplex. But the seemingly large number of foreclosures is relative to the huge number of properties in the area overall. I wouldn’t read too much into the raw numbers. A better metric would be the percentage of foreclosures relative to the economically healthy base. (Or the lack there of.) Poke a little deeper and see what you find. My guess is that some pockets will be strong while other areas are failing outright. The market is sorting zip codes into haves and have nots.